Contact paper is one of those remarkable products that can be used for more than just lining shelves. Contact paper is available in a variety of patterns and textures today. You can find rolls that resemble granite, wood and metals. Contact papers are so realistic that you have to look carefully to make sure they're paper. It is the perfect medium for crafting! Metallic contact paper can give a touch of elegance to all of your craft projects. Add some gold metallic strips to the outside of a ceramic bowl to add an instant upgrade. It looks like a home decor piece you would buy at a trendy boutique. So cute and stylish! Protect your expensive wood furniture from water spills with coasters. 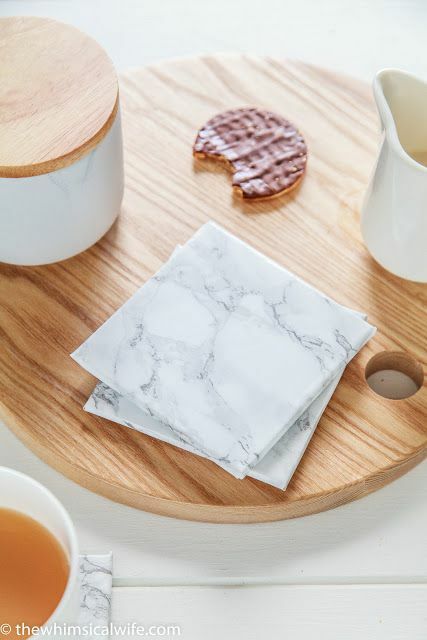 Make some trendy "faux marble" coasters with ordinary tiles and marble patterned contact paper. You may have to look twice because these coasters resemble expensive Carrara marble. IKEA is known for trendy low priced home decor that you have to assemble yourself. There are dozens of blogs devoted to customizing IKEA furniture. This tutorial takes ordinary LACK shelves and customizes them with copper metallic contact paper. They look like one of a kind high-end designer pieces for your home. No one will ever know that these beautiful shelves are DIY specials. This project is for those of you that love the look of marble vases but don't love the price. Wrap contact paper around cheap dollar store glass vases for a fancy look at budget prices. Arrange three faux marble vases that are different heights onto your coffee table to make an elegant tablescape. Do you love the signs for sale in many of your craft and home decor stores? It is so easy to make your own. Mindi from My Love 2 Create has a tutorial demonstrating how to make beautiful signs from pallets and scrap wood. Why not save some money, however, with contact paper? You will have more to spend on craft supplies. We all love that! Are you tired of your boring bathroom tile floor? Did you know that you can update it without the backbreaking labor and mess of removing the tiles? You can add some pizzazz with–you guessed it–contact paper. This tip, however, is not a permanent solution. Contact paper is a temporary quick fix that works very well for renters or those who wish to update their bathroom floor without damage. The contact paper can be quickly removed when it is time to go. Just be gentle when cleaning your bathroom floor and your update will last for awhile. Many crafters like to recycle objects into creative crafts. Create a smart DIY room divider from leftover albums covered with contact paper. No one will ever guess the humble origins of this modern room divider. Add some graphic style to your space that will be the envy of your friends. Toddlers with love this contact paper toy. Cut a tree shape from contact paper and tape the non sticky side to a glass door. Peel off the paper backing and have your toddler decorate the tree with foam ornaments. Your child will love decorating and redecorating their "own" holiday Christmas tree. Customize cork coasters with the contact paper of your choice. Just cut contact paper circles to fit the inside of the coaster, peel and stick. You can have drink coasters to match your home decor in under five minutes. The easiest home decor craft project ever! Not everyone can afford to replace white or black kitchen appliances with stainless steel appliances. Did you know that you can quickly update your appliances with stainless steel contact paper? Be on trend, save some cash and give new life to your kitchen decor with metallic contact paper.